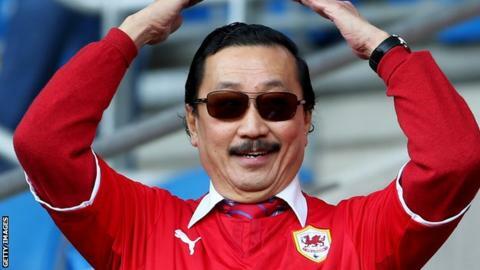 Russell Slade insists Cardiff's players will listen to owner Vincent Tan's demands "to shoot more" because they do not have "Lionel Messi" in their team. Slade, who revealed his desire to stay at Cardiff long-term despite fan pressure, says the players understand. Tan told BBC Wales: "In every match I want to see 30 or 40 attempts on goal." Cardiff boss Slade explained: "The more attempts at goal, the more you take, the idea being you score or test the goalkeeper." Tan outlined his football philosophy in a question and answer session with supporters on Thursday, where he revealed he plans to reduce the club's £140m debt by half. "Just shoot from 25, 30 yards, I told the players. What's the point of passing, passing, passing and hoping to get in the box that way," Tan said. "Unless you're Lionel Messi looking for a tap-in, it's not going to work. "They get the ball and it seems to be like a hot potato. Pass it to somebody else straight away. As fans, you must see that, because I do. "The law of averages says the more you shoot, the more you'll score. If you shoot 30 times you'll get three goals, 40 times will be four goals, 50 times and you'll get five goals. "Don't respond by saying I know nothing about football. I've learned an awful lot, I see players regularly scoring in the Premier League from distance and we have to do that." Cardiff are ninth in the Championship, five points outside the play-offs, and Slade insists his players will listen to their major shareholder. "The players sat and listened to that, they saw the logic of taking opportunities when they come to them," he said. "I think all players know that, whether you are shooting from five, 10 or 25 yards out." Slade has admitted he wants to stay with the club beyond this season when his current contract expires and Tan has called on fans to back Slade although the Malaysian entrepreneur has not given the Cardiff boss no assurances.